Researchers at Northeastern University have now built a robot that can walk around on two legs before it starts jumping and flying short distances to get over obstacles in its path. 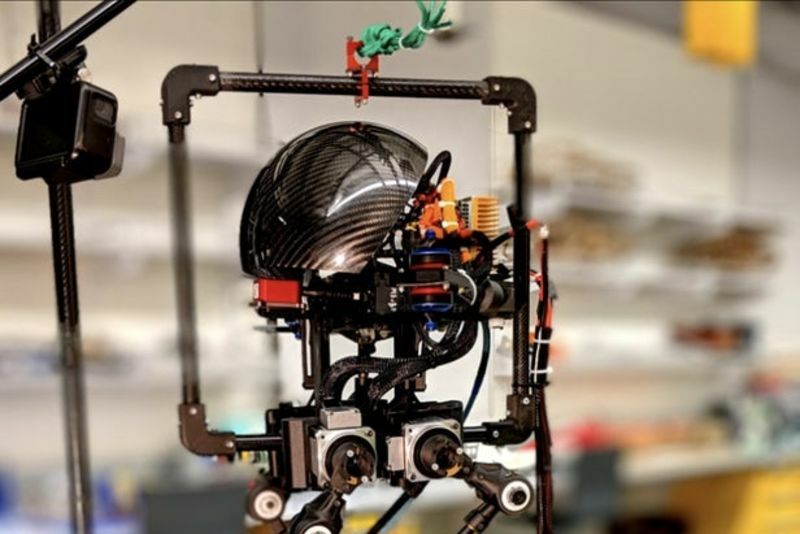 The team behind this little robot call it Leonardo, in one of the biggest stretches ever made for an acronym – apparently, it stands for LEg ON Aerial Robotic DrOne. Leonardo stands at about 0.8m tall, and has a "chicken walker" stance, with a body perched atop two spindly legs. To give him a good balance of strength and lightness, Leonardo is made mostly of carbon fibre and apparently weighs just 2.7kg. The robot also has a pair of thrusters on his sides that are strong enough to let him fly. He won't exactly be as manoeuvrable in the air as a regular old drone, but that's not really the goal. Instead, Leonardo's thrusters are designed to give him more air-time after a jump, allowing him to leap over obstacles and land safely on the other side. Those thrusters can also help the robot keep its balance. Although it seems effortless to us humans, keeping a bipedal robot from faceplanting on uneven terrain or just a light breeze is harder than you might think. After all, just five years ago Boston Dynamics' creepy ATLAS robots were stumbling around like drunks – now they're running through the woods, performing parkour and even landing backflips like pros. Leonardo could show similar stability, firing up the thruster on one side if he starts to tilt that way. Leonardo isn't necessarily the first robot that can both walk and fly – a few years ago an EPFL team built a bat-like bot that could also move on land. But that one was predominantly a drone that could crawl, making it almost the exact opposite of Leonardo as it was more at home in the air than on the ground.